Couple of years back a lady posted a "Chapati" post on the website I frequent, it was all good but the bread she posted was really a Paratha rather than Chapati, I tried to explained her the difference. To my surprised, she took it very defensively and told me that she can't be wrong mainly because her neighbor, who is originally from Hyderabad was her teacher in this matter. Who am I to argue with an Indian origin, right? After that episode I have been meaning to write about paratha and chapati, my plan is to write about three different ways to make plain paratha. And here is the first one. ROTI is a traditional unleavened whole-wheat bread which, depending on the country and the cook, can be as thin as a "skin" or soft and pliable, closer to a pita. Rotis are eaten mainly in North India but are known as "phulkas" in the West & the South parts of India. Deep fried versions are known as "poori". CHAPATI is traditionally made from very finely milled whole wheat "chapati flour" and tend to be thin and papery. They are made using a 3 fold process into a triangular shape and then rolled out into a circle. Each layer is well oiled (ghee), resulting in thin layers. This type of flatbread is also known as "poli" and eaten commonly in the Western & Southern regions of India. Nowadays, many cooks add a tbsp or so of yogurt to the dough with the end result being soft chapatis without the excess use of oil or ghee. PARATHA is a North Indian flatbread that may be stuffed or not. It is usually on the thicker side and may have several layers (8-10) that are well oiled with ghee. NAAN, which is made from white flour and leavened either with a starter or with yeast. 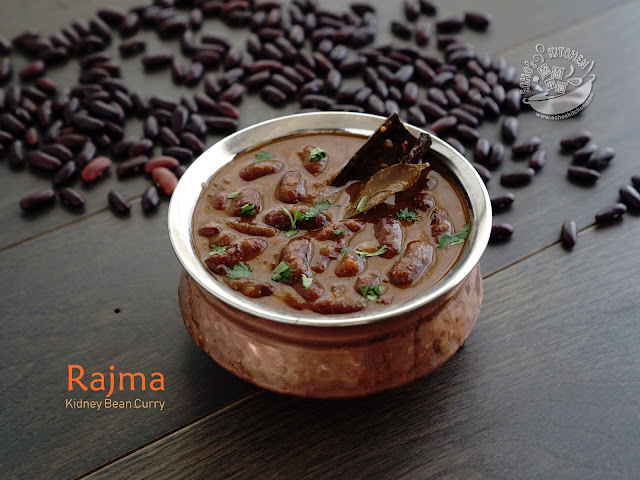 It is traditionally made in a tandoor oven. BHATURAS are fried versions of naans. They are eaten with chole. Knead together all ingredients listed under dough to form a soft dough, let it sit for about 30-40 minutes before rolling into bread. 1. Pull out dough the size of ping pong ball, roll it out to form a disc, spread some ghee or oil, and sprinkle a pinch of flour, lightly and evenly spread the oil to cover the whole disc. 2. Use a knife to slice from the center of the disc like you would cutting a pie but not cutting the disc into half, then start rolling the bread from the cutting edge to form a cone. 3. Turn the cone upside down where the pointed part facing up, and press the cone down using palm or fingers to flatten it. 4. 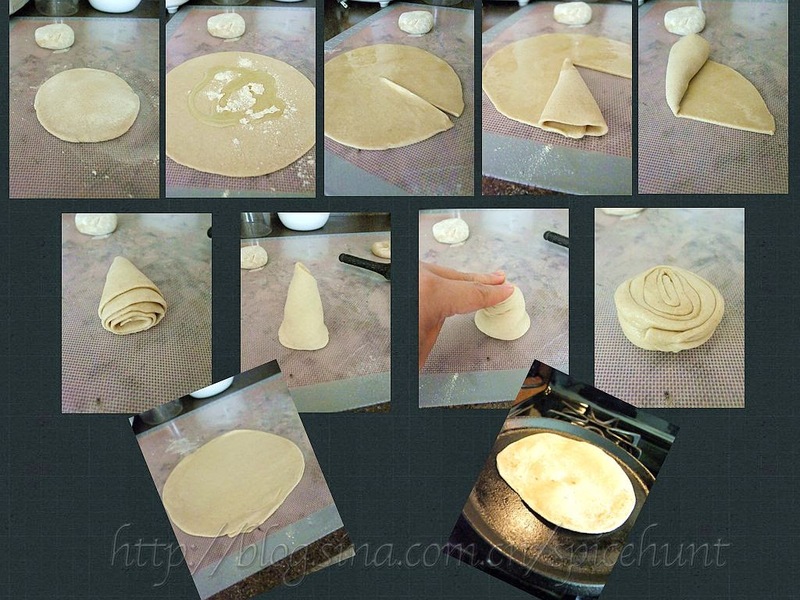 Use a rolling pin to roll the dough out to form a flat disc about 2-3 mm thick. Pan fry the pancake with a little ghee until golden brown in color and beautiful brown spots form. 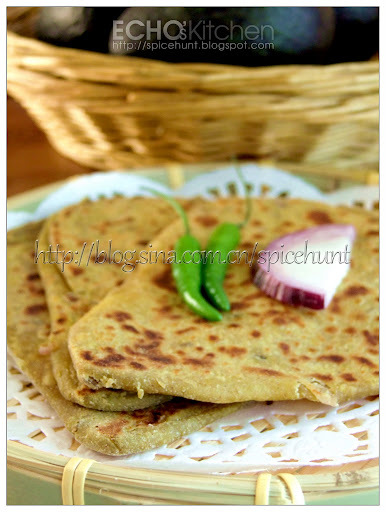 This paratha is layered,soft and yummy, it goes well with any vegetables and curries.